Salmon need help in California. Unfortunately, L.A. Times opinion writer, Michael Hiltzik, isn’t doing them any favors by furthering the notion that more water in the Delta’s sterile waterways is the solution. Hiltzik completely ignores the economic consequences that have devastated San Joaquin Valley farms, farmworkers, and communities as a result of water supply cuts that were designed to help endangered salmon and Delta smelt. These practices have failed to achieve their intended benefit- restoring fish populations- and instead have wreaked havoc on a large part of one of California’s prime food-producing regions. There is little evidence backing the claim that more water flowing in the river will help restore salmon populations. According to the National Academy of Sciences, the bigger issues have been poor ocean conditions, the loss of salmon rearing habitat, channelized waterways, and non-native predators. In addition to addressing all of these factors, another strategy that has been proven helpful is the use of “functional flows,” which utilize timing and more moderate amounts of water to meet the specific needs of fish. In the case of the Butte Creek Salmon Recovery project, functional flows plus improvements in habitat and better access to the upper reaches of Butte Creek achieved far more than simply pouring more water down the river. The project effectively increased the number of returning salmon from about 100 spring run Chinook per year in the mid-1990s to as many as 20,000 in just a few short years. And it was done without devastating impacts on farms and communities. Hiltzik and California’s commercial salmon fleet would do more to help their cause if they supported ongoing, more scientific approaches to salmon restoration. Butte Creek is just one example of successful science-based approaches undertaken by a progressive partnership that included Sacramento and San Joaquin Valley farmers, environmental groups, California urban water agencies, the Department of Interior, and State Department of Fish and Game. Other efforts underway include projects where farmers use harvested fields to mimic flood plains with broad support from researchers, community leaders, farmers, and conservationists. These projects help build the food chain from the bottom up by taking advantage of the natural process that supports the growth of phytoplankton, the foundation of the food web. 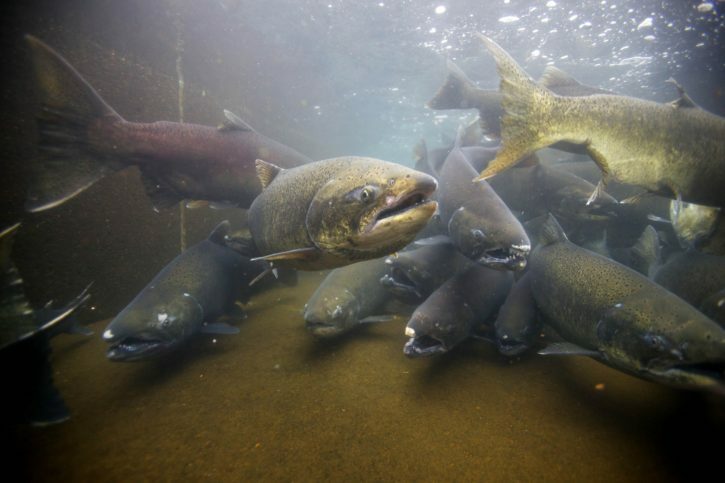 Salmon that are allowed to linger in managed farm fields grow faster, stronger and are more vigorous than fish left to forage for scant food supplies in the levee-constrained Sacramento River. And these are just a few of the collaborative efforts around that state that are showing us how to help fish thrive. Sadly, while one-sided advocates like Hiltzik push for the same old failed strategies, salmon, and the commercial fishermen who depend on them for their livelihoods, will fare no better because their supporters are focusing on what experts say is “lazy science” and is an oversimplification of a complex issue. Solving the many issues affecting the viability of the salmon industry is complex, but doggedly pursuing wasteful water policy won’t fix the plight of commercial salmon fishermen. Merely seeking to shift blame and avoid the hard work of establishing functional flows, habitat restoration, food web development, predation controls, and discharge reduction is a proven path to failure.